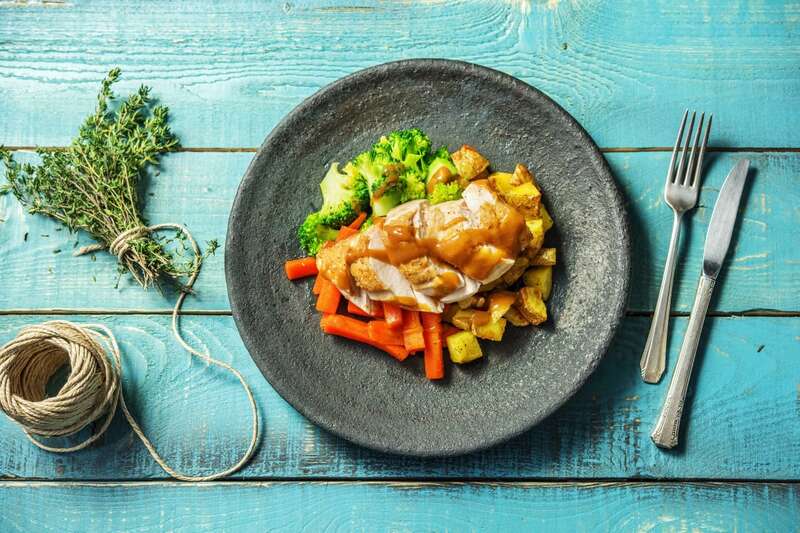 Roast chicken may be such a frequent meal in your home that you can cook it with your eyes closed. What's special about this dish you may ask? It's all about the gravy! In this recipe you'll learn how to make a great gravy by making a roux (a traditional sauce thickener) with flour and leftover chicken fat. Chop the potato into 2cm pieces (no need to peel). Peel the carrot, then chop into batons about the size of your little finger. Separate the broccoli into florets. Pull the thyme leaves off their stalks (discard the stalks). Put the potato on a baking tray with a drizzle of oil and a pinch of salt. Give the tray a good shake. Roast on the top shelf of your oven for 30 mins. Season the chicken with a pinch of salt and black pepper. Heat a drizzle of oil in a frying pan on medium-high heat and lay in the chicken skin-side down. Cook for 4-5 mins. Remove to an oiled baking tray skin-side up and sprinkle over the thyme leaves (don't wash the frying pan, you'll need it for the gravy). Pop on the middle shelf of your oven for 25-30 mins. TIP: The chicken is cooked when it is no longer pink in the middle. In the meantime, put two large saucepans of water on to boil. Once boiling add a pinch of salt and the carrot to one pan. Cook for 10-15 mins. Once cooked, drain and return the carrot to the pan. Add the honey, a really good grind of black pepper and stir well. Cover with a lid or foil to keep warm. Pop the broccoli in the other pan of boiling water with a good pinch of salt. Boil for 5 mins or until tender, drain. Meanwhile, put the frying pan back on medium heat and add the flour. Stir the flour into the chicken juices (if the pan is a bit dry just add a splash of oil). Cook for 2 mins. Stir a couple of times until the mixture is properly combined and has cooked slightly. Cut the chicken into 2cm thick slices, serve on plates with the mini roasties, veggies and a drizzle of gravy.